HAWTHORNE, California -- NASA Administrator Charles Bolden visited SpaceX Headquarters in Hawthorne, Calif., Thursday, capping a tour of the SpaceX facilities. NASA Administrator Charles Bolden and SpaceX CEO Elon Musk congratulated workers Thursday at the company's Hawthorne, Calif., headquarters on the successful flight of the Dragon spacecraft in May -- the first mission by a commercial company to resupply the International Space Station. The capsule behind them is the Dragon spacecraft that flew on a demonstration mission in December 2010, during which SpaceX became the first private company to recover a spacecraft after it orbited Earth. 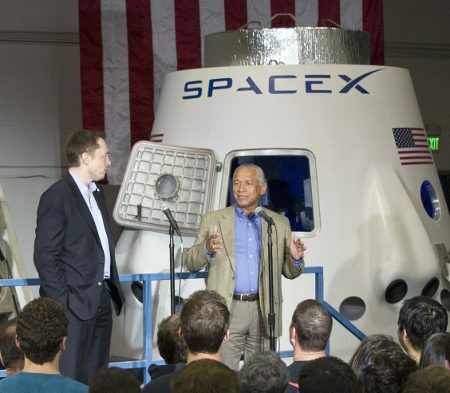 Bolden and SpaceX CEO and Chief Designer Elon Musk addressed more than 1,000 employees who helped design, launch and safely recover the company's Dragon capsule in May following its trip to the space station. "NASA has its sights set on reaching an asteroid and Mars and commercial space companies like SpaceX are helping make that possible by taking over the challenging transportation of cargo to low Earth orbit," Bolden said. "The International Space Station is the key to our human spaceflight efforts right now and SpaceX's successful resupply demonstration mission helped ensure it can achieve its full potential. We look forward to Dragon becoming a regular visitor to the station." While on-site, Bolden had an opportunity to see the first Dragon spacecraft to be recovered by the company in December 2010, following a demonstration mission to orbit and safely return a capsule. The trip to Hawthorne followed a visit by Bolden and Musk Wednesday to the SpaceX Rocket Development Facility in McGregor, Texas, where they viewed the most recently recovered Dragon capsule. The spacecraft splashed down in the Pacific Ocean May 31 following its 9-day mission to carry and return cargo to the space station. Bolden also had the opportunity to view some of the 1,367 pounds of cargo the Dragon spacecraft returned to Earth. Dragon currently is the only spacecraft capable of returning a significant quantity of science experiments and cargo from the station. Experiments will be given back to researchers hoping to gain new insights provided by the station's unique microgravity environment. The cargo was transferred to NASA June 13 and will be taken to the agency's Johnson Space Center in Houston for further processing. Dragon's journey to the station was SpaceX's second demonstration mission under NASA's Commercial Orbital Transportation Services (COTS) Program, which provides investments intended to lead to regular resupply missions to the space station and stimulate the commercial space industry in the United States.